Online video now reaches a mainstream audience; 57% of online adults have used the internet to watch or download video, and 19% do so on a typical day. The growing adoption of broadband combined with a dramatic push by content providers to promote online video has helped to pave the way for mainstream audiences to embrace online video viewing. The majority of adult internet users in the U.S. (57%) report watching or downloading some type of online video content and 19% do so on a typical day. Three-quarters of broadband users (74%) who enjoy high-speed connections at both home and work watch or download video online. Looking separately at those who have access to a high-speed connection at home, 66% report online video consumption, compared with 39% of home dial-up users. Yet, some online video viewers who have dial-up at home are able to supplement their access with broadband connections at work. Among those who are truly relegated to slow connections at home and work, just 31% say they have watched or downloaded video online. Three in four young adult internet users watch or download video online. Roughly one in three (31%) internet users ages 18-29 said they watched or downloaded some type of video on a typical day during the period of this survey. By comparison, 18% of internet users ages 30-49, 12% of those 50-64 and 10% of those 65 and older watch or download any type of video on the average day. News video is the most popular category for everyone except young adults. News outlets were among the first big investors in the online video realm and their early-mover advantage shows. News content captures the attention of users across all generations, and is the most popular genre with every age group except for those ages 18-29. Overall, 37% of adult internet users say they watch news videos, followed closely by comedy or humorous videos at 31%. For young adults, comedy is a bigger draw, with 56% watching humorous videos, compared with 43% of internet users ages 18-29 who say they watch news videos. 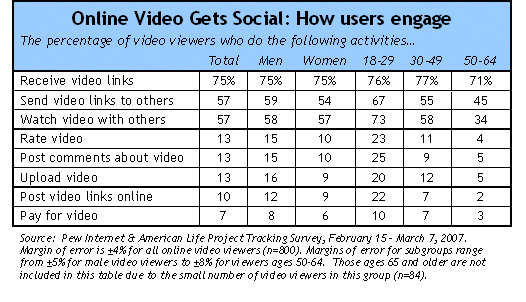 More than half of online video viewers share links to the video they find with others. The desire to share a viewing experience with others has already been a powerful force in seeding the online video market. Fully 57% of online video viewers share links to the videos they find online with others. Young adults are the most “contagious carriers” in the viral spread of online video. Two in three (67%) video viewers ages 18-29 send others links to videos they find online, compared with just half of video viewers ages 30 and older. Video viewers who actively exploit the participatory features of online video – such as rating content, posting feedback or uploading video – make up the motivated minority of the online video audience. Again, young adults are the most active participants in this realm. Most online video viewers have watched with other people. Online video consumers are just as likely to have shared a video viewing experience in person as they are to have shared video online. The picture of the lone internet user, buried in his or her computer, does not ring true with most who view online video. 57% of online video viewers have watched with other people, such as friends or family. Young adults are the most social online video viewers; three out of four video consumers (73%) ages 18-29 say they have watched with others. Professional videos are preferred to amateur productions online, but amateur content appeals to coveted segments of the young male audience. Overall, 62% of online video viewers say that their favorite videos are those that are “professionally produced,” while 19% of online video viewers express a preference for content “produced by amateurs.” Another 11% say they enjoy both professionally-produced video and amateur online video equally. For young adult men – one of the most coveted audiences for advertisers – there is a much narrower pro-am gap. Some 43% of online video users in this cohort express a clear preference for professional video, while 34% say they prefer amateur content. Another 19% of male video viewers ages 18-29 say they enjoy both amateur and professional content. Few pay to access online video. Providing free access to video content has been central to the popularity of YouTube and other online video portals. At the moment, few online video viewers are paying for any of the video they watch; just 7% say they have paid to access or download video online. However, young adults, who are often thought to have little interest in paying for music and other digital media, are actually more likely than older video viewers to have paid for online video content. While 10% of online video viewers ages 18-29 have paid to access or download online video, just 3% of video viewers ages 50-64 have done so.